The launch of a major iOS release is a momentous occasion for mobile game developers. This year is no different, with Apple’s rollout of iOS 10. Today, we’re happy to announce the release of Chartboost SDK 6.5* for iOS and Android, offering support for iOS 10, all-new ad formats including animated GIFs and playable ads, and a refined video ad experience. And one more thing: a 20 percent bonus on video ad revenue! In testing of SDK 6.5, developers saw rewarded video eCPM increase up to 10 to 40 percent. Among particular publisher genre apps, rewarded video eCPM increased by up to 35 percent in city-building games, 42 percent in match-3 titles and 40 percent in first-person shooters. As part of iOS 10, Apple is introducing major changes to its Limit Ad Tracking privacy option. These changes impact ad serving across all mobile games running iOS 10. Users that choose to turn on Limit Ad Tracking will affect any developer using a non-iOS 10 compatible SDK by limiting control over the number of ads shown per user. Further, users with Limit Ad Tracking enabled restricts proper attribution of installs that you deliver to advertisers, potentially lowering eCPM. You can ensure that your Chartboost integration continues to run smoothly by upgrading to iOS SDK 6.5. Earlier this year, thousands of developers like you upgraded to Chartboost SDK 6.4, earning a 20 percent bonus on video revenue during May to July. To kick-start the launch of SDK 6.5, we’re bringing the bonus revenue program back. From October to December, you can get a 20 percent bonus on video revenue flowing through SDK 6.5! Simply integrate SDK 6.5 in your mobile game by September 30 to earn bonus revenue for all three months. Can’t integrate by September 30? No problem! You can upgrade at any point from October to December and earn bonus revenue starting on the date your mobile game is live with SDK 6.5. Don’t hesitate! The sooner you upgrade, the longer you’ll earn a 20 percent bonus on video revenue from SDK 6.5. Want to enhance revenue by up to 40 percent? 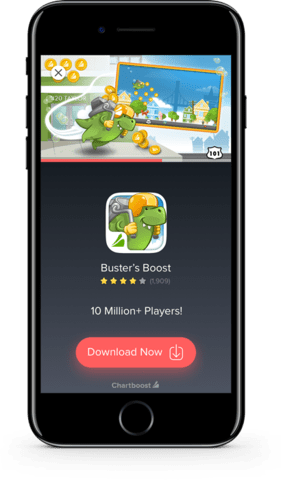 You could drive double the impressions to Chartboost video ad campaigns by giving a higher priority to those video ad placements. At Chartboost, we’re constantly revisiting and improving the ad experience. New in SDK 6.5 is a refined video ad experience. Portrait mode video isn’t the most optimal viewing experience for players, so we went back to the drawing board to make the most of the screen real estate and make portrait videos feel more natural. Now videos in portrait view utilize the top third of the screen, so it’s at the optimal eye height for players. The call to action button now resides at the bottom of the screen, making it easier for players holding a mobile device in one hand to tap the CTA. What about app icons? App icons create a lasting impression in the minds of players, so it’s no wonder that developers spend so much time refining them. Portrait-oriented video ads from SDK 6.5 give app icons the prominence they deserve, with placement right in the center of the screen. Access SDK 6.5 now for iOS or Android by following the relevant download links below. Check out our easy-to-follow SDK upgrade guides to get SDK 6.5 up and running in no time. *Chartboost Unity SDK and Adobe Air SDK with iOS 10 support are now available! Grab the Unity SDK here and Adobe AIR SDK here.